My dad has always loved to cook. I remember strands of his handmade pasta hanging off the back of every chair when I was a kid. This is one of his recipes that everyone adores. 1- In a heavy pot or Dutch oven, melt the butter or coconut oil on medium heat. Add the thinly sliced shallots and cook about 5 minutes, until they begin to turn golden brown and the edges are getting crispy. Use a slotted spoon to remove half of them to a paper towel to drain, salt them, and reserve them for later. 2- Add the celery, garlic, ginger and curry powder to the pot and cook about 1 minute or until everything gets fragrant. 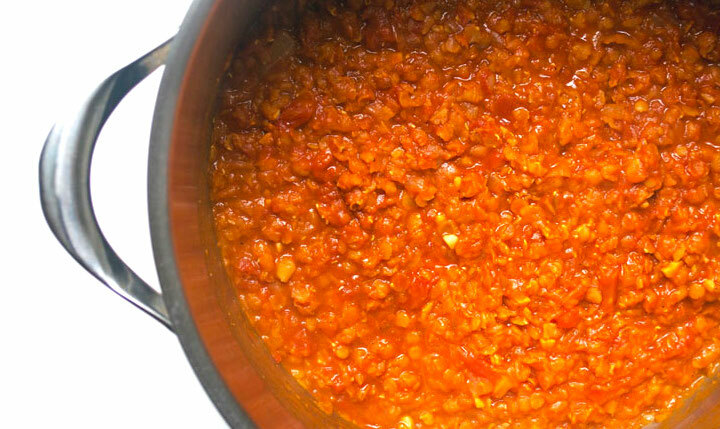 Add the lentils, stock, and tomatoes, and simmer for about 30 minutes or until the lentils are very soft and breaking up. 3- Add the coconut milk and salt and pepper to taste, and cook about 10 more minutes or until all the flavors are blended together. Ladle into bowls and garnish with chopped parsley and the reserved crispy shallots.